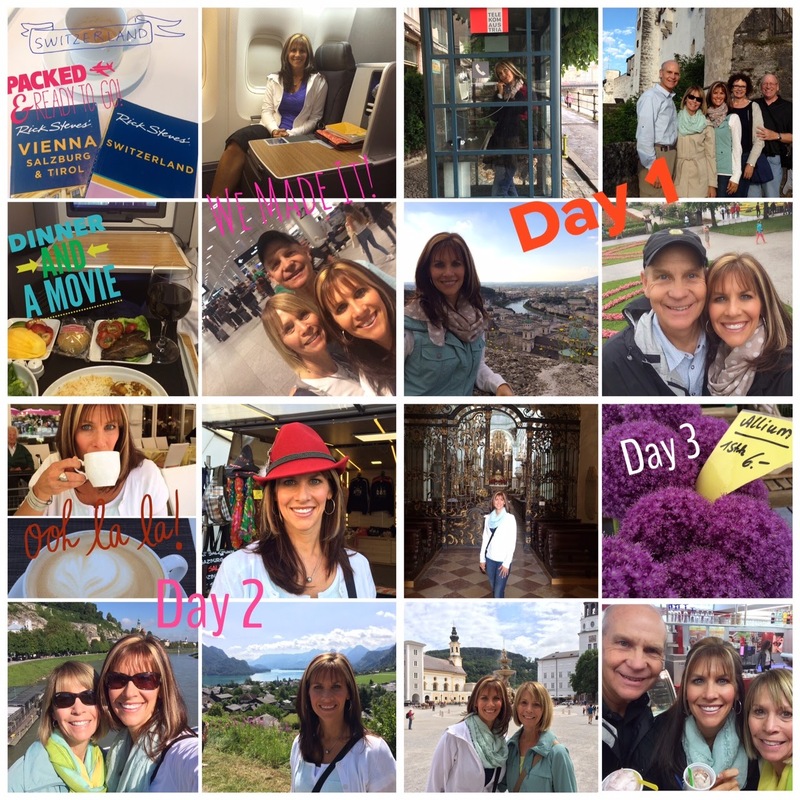 Healthy, Fit, and Focused: European Dream Vacation! Well, this is totally a personal post today. 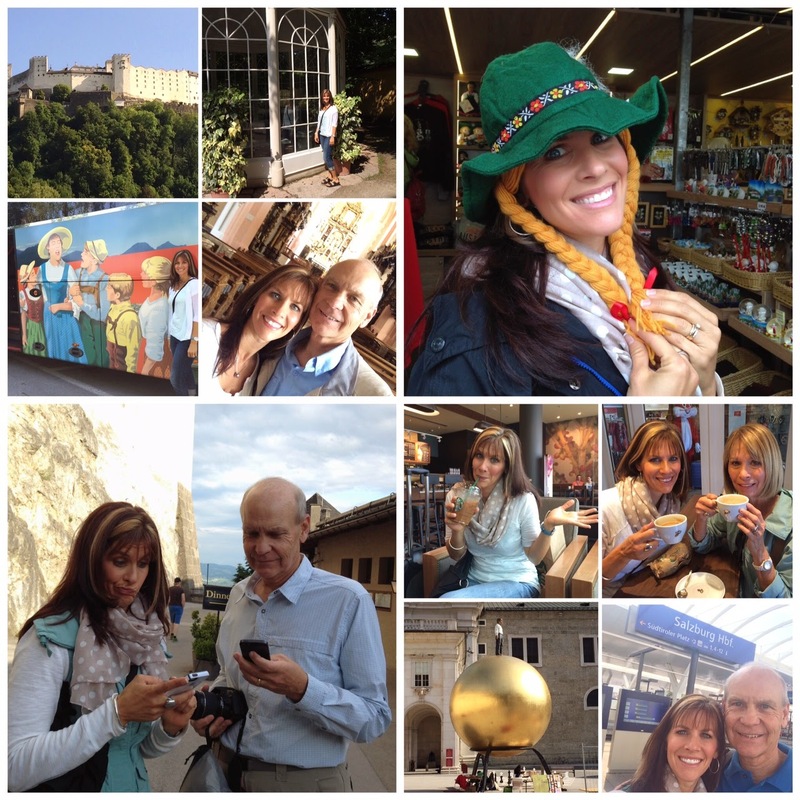 I've had an amazing opportunity to go to Salzburg, Austria and Switzerland. It was a gift from my parents given over 4 years ago for my 30th birthday. Unfortunately we had to postpone our trip but now finally my husband and I are able to go to Europe with my parents! We flew from San Diego to JFK then onto Zurich, Switzerland. I felt like a little kid in a candy store as we were coming into Zurich. I really didn't know what to expect for the entire trip and so my expectation were completely in check with no real expectations. The land though was so different than what we have here in Southern California. While we are very green (wherever it is watered) the land is very brown and where there are no sprinklers. I'd been to Europe one other time before, but it was in High School, and I definitely didn't have the same appreciation as I do now! After a LONG day of flying and about a 5 hour train ride, we finally made it to Salzburg, Sound of Music land (yes, I'm a fan!!). Well, I won't bore you with all the details, but definitely wanted to share some amazing memories and pictures! I also discovered an additional WHY as to why I am building this Beachbody business. I want to TRAVEL more...and I want to share experiences like this with MY children! So here it is...a plethora (I love that word) of pictures. Sorry...I'll try not to bore you too much! We left Austria and then it was back to Zurich to pick up the love of my life!! Jonathan had to come a week later but was so gracious to hold down the "Little" house while I was gone!! Thanks Babe! We stayed in a little town in Switzerland, called, Wengen. It was beautiful. Overlooking a valley in the Swiss Alps, it was breathtaking! I'm ready to sell everything and go live in Wengen!! Our plan was to HIKE!! Literally, you could hike for weeks here and never do the same trail twice! All the trails are so well marked so you don't get lost (thank goodness!!)! 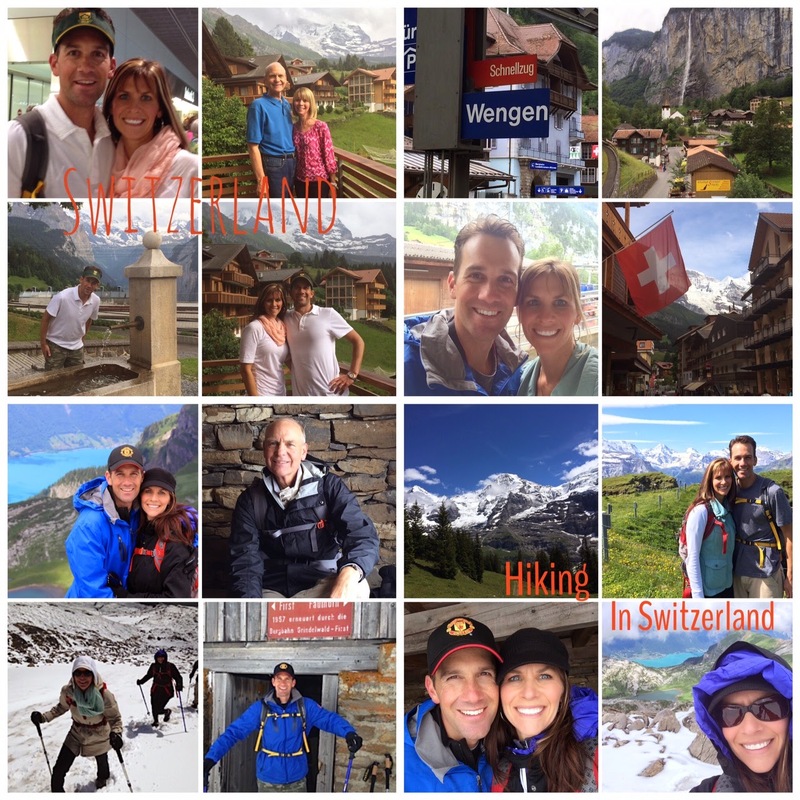 Nothing like Hiking in the Swiss Alps...Absolutely Beautiful! Our first full day we went out for the "long hike". This was a 10+ mile hike...and it was NOT easy! I was SO proud of my parents, they did amazing on this hike. We battled all the elements on this hike from First to Schynige Platte. It was supposed to be a partly sunny day which ended that way. But before then, we got rain, fog, wind, SNOW (yes SNOW on June 30), more wind, below freezing temperatures, some clearing and then finally some SUN!!! What an adventure we will never forget!! Oh and not to mention, we made it to the final destination with 5 minutes to spare before the last train took us back down the mountain. Fortunately we made it otherwise it was another 4 hour hike to the next town, after we had already been hiking for about 8 hours!!! Not bad for a day of hiking! Well, like I said earlier, this was a delayed Birthday trip gift from my parents...and it wouldn't be a birthday trip without being here over my birthday! July 3rd...it was the most spectacular day we had our entire trip! Absolutely breathtaking! 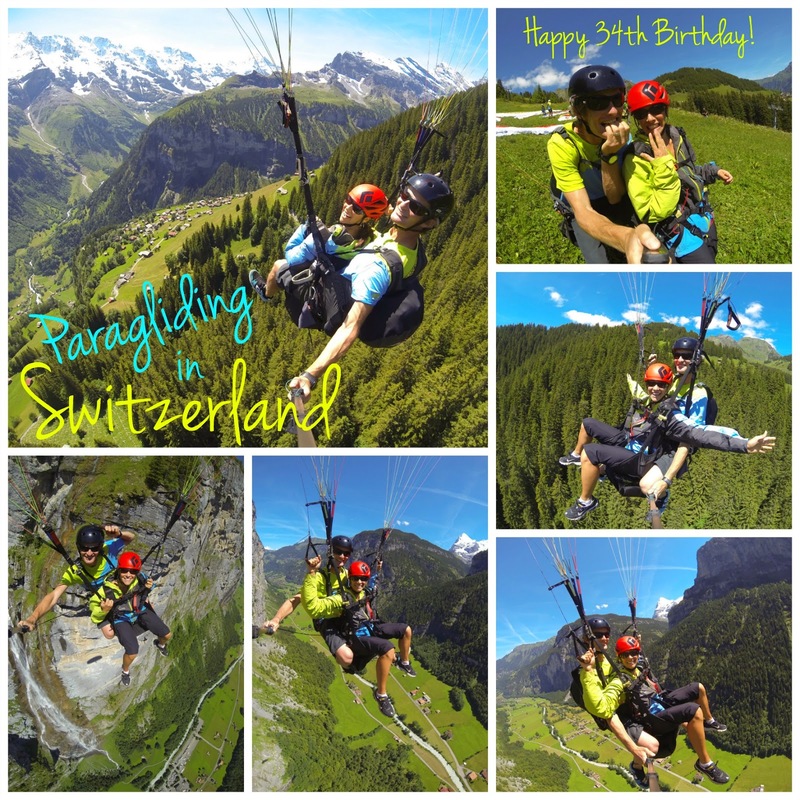 So...what do you do on your 34th birthday when in the Swiss Alps? You fly off a mountain!!! Yep, we went paragliding...it was AMAZING!!! I was nervous in the morning, but as we got closer to the time, my nerves started to diminish and by the time I was ready to take off...my husband was more nervous for me to go than I was! That's because I took off first and he watched me run and fly off of the mountain! We got about 20 minutes of air time and I could have stayed up there for another hour. There was no sense of "dropping" or anything it was peaceful and calm. If I ever have the chance of doing it again...100% I will!!! 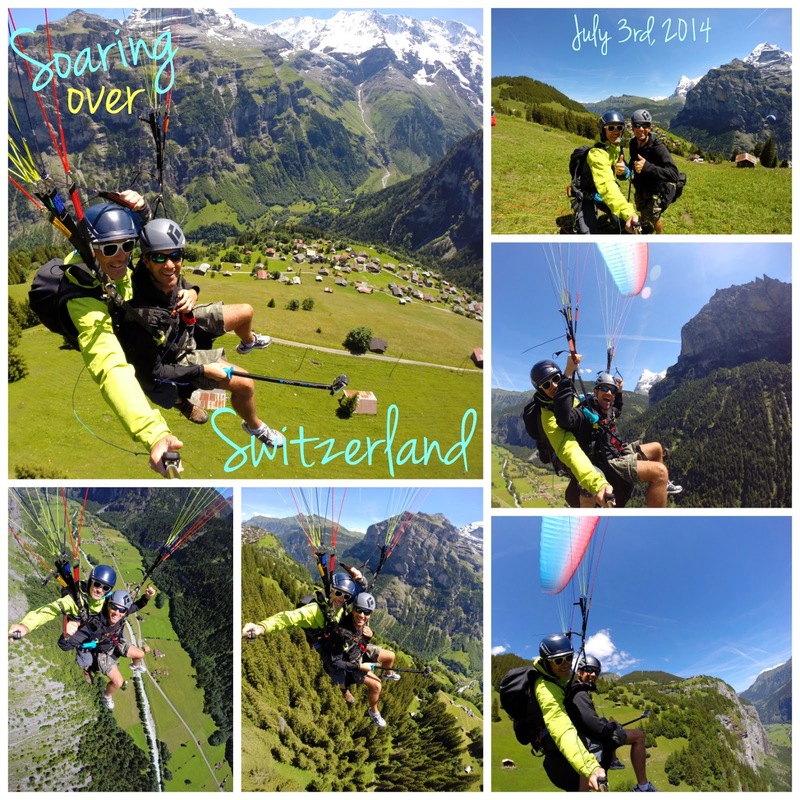 Jonathan Paragliding over the Swiss Alps! 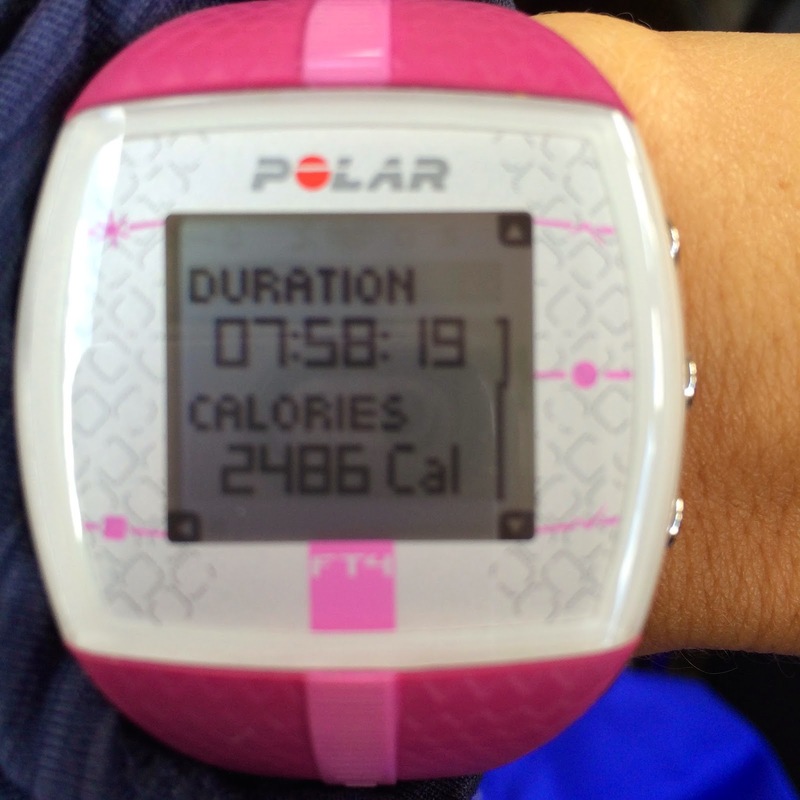 My watch even told me Happy Birthday! 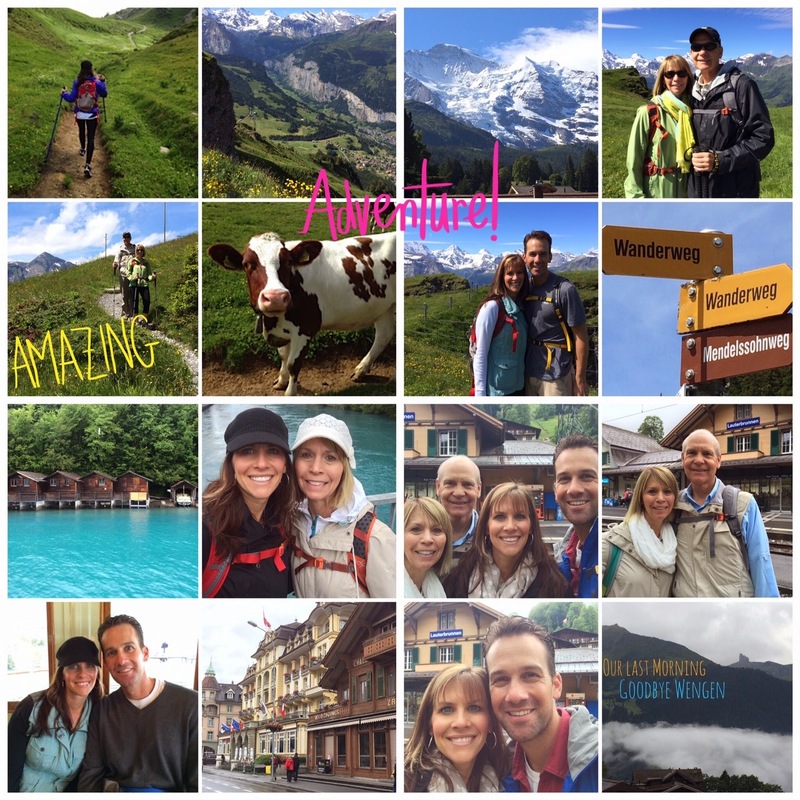 More Swiss Alp Hiking and Exploring the Towns! Well our time had come to an end. This has put a bug in me for more world travel! I will definitely return and dream of bringing my kids here to do some hiking too! Absolutely once in a life time trip and I'm so grateful to my parents for this amazing gift! Love you mom and dad!! It was off to Zurich for an evening and then flying back home the next day!! We got in late on Sunday night and I had no idea that the kids were going to surprise us at the airport! It was so great to see Katelyn and Anthony...Jeremy was away at a camp, so I had to wait to see him for another week! Thanks Nana for bringing the kids to surprise us at the airport!! There WILL be a next time and I can't wait to experience something new again! !